Cejay FlexLight-Sticks™ » Protective Solutions, Inc. The FlexLight-Stick™ is a reusable alternative to chemical glow sticks which can add up to cost savings at the end of the year. It is far too easy to bend and inadvertently activate traditional chemical-sticks, making them useless when needed later. With its unique flexible end, the FlexLight-Stick™ can be folded during storage or use. The FlexLight-Stick can be twisted or bent during storage or mission and will only turns on with a twist of the end cap when needed - not before. The FlexLight-Stick uses a long-life battery, so fewer are needed. 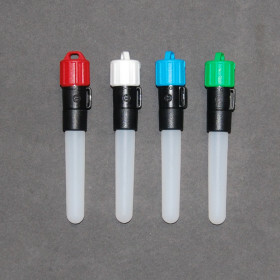 End caps are colored coded to the light color. The squared off eyelet attachment point allows the FlexLight-Stick™ to be attached using 550 cord, or zip-ties to MOLLE, packs, vests, etc. Size - 4.65" x 0.75" x 0.75"